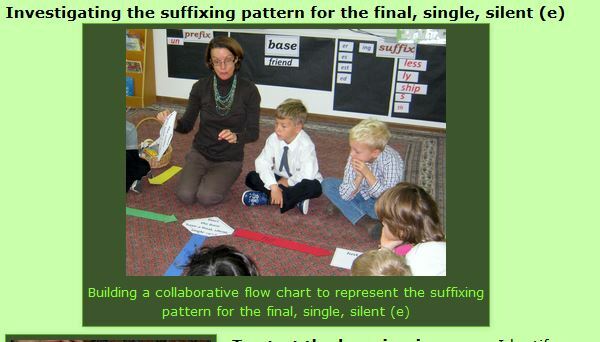 In previous posts, there have been references to or images of my particular version of the “word wall.” As I end three years teaching Grade One, I thought I would share a deeper description of the rationale, creation and application of this tool. I do so because it is one of my few actual innovations (inadvertent as it was); because the students and I think it was useful; and because I suspect there are folks out there who might use and probably improve on it. As always, this is not prescriptive: you might try this out exactly as I have, or you might encounter ideas or principles here that you apply in some very different way. When I was first thrown into Grade One, and had to spend a weekend creating a primary classroom, I thought “I need a Word Wall. All those primary teachers have Word Walls.” But I wasn’t clear what they were used for, or how they were created, and I found the convention of organizing the words alphabetically somewhat confounding. My Real-Spelling-fueled intuition suggested that there was something fundamentally shallow or limiting in this approach. I wanted to ensure that my word wall reflected and helped teach solid orthographic principles. My original conception therefore was simply to organize words by vowel, and so I had only five categories. This proved immediately unworkable, as the vowel letters so rarely work alone. Where would <eat> go? Very quickly, it seemed to make sense to me to organize them by central vowel phoneme, by sound. I created a structure built around long and short vowel phonemes. My categories were written on the colour-coded cards pictured above. (Note: this works in the First Grade because most of our words have a single syllable. I am not sure yet what I would do in Grade Two or beyond, but I am going to find out next year, in Grade Four). Central for me is that the Word Wall be a living document, created collectively and useful to all. Thus, when the school year begins, it is empty. (In reflecting at the end of the year, several students said “I remember the first word we put on there”, which I mention because it highlights their sense of ownership). My first year in Grade One, the thing got a little out of control with sticky notes. There are areas in my classroom where students are encouraged to independently add words or questions (see this post), but for the “Word Wall”, I came to want a little more control over what words are included. Because this becomes a resource for the students in their writing and their reading, and because there is a loose bank of common words that students will regularly want to use in their writing or encounter in their reading, I have attempted to make these the focus. These are the “high frequency” or “sight” words so useful to developing fluency. These are certainly not the only words we include, but they fairly naturally become the main body of our collection. Now, I could probably predict these words before the students walk in the door in September (Dolch, Fry, et al are examples of attempts at such lists), and so the words could be up there already. Why not? Then the resource would be available to them from the get-go. There are a couple of reasons why I prefer to have the students involved in the posting of the words. 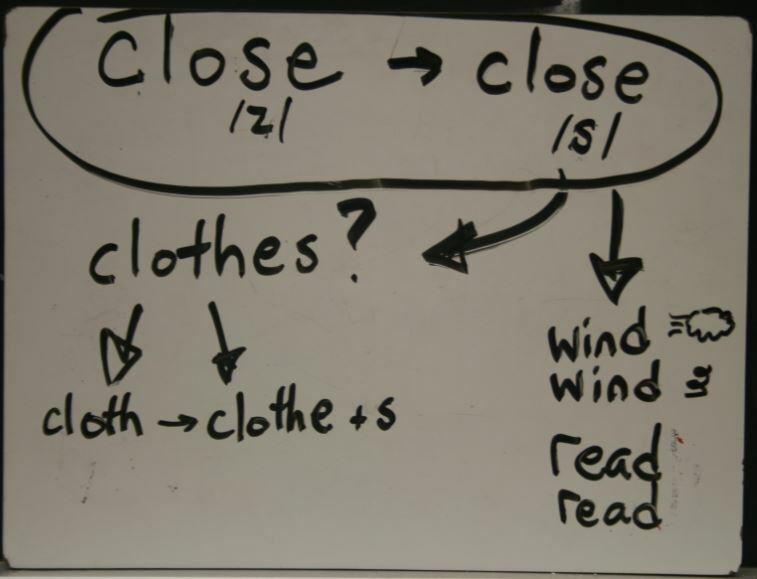 Firstly, it allows us to find the words in the context of our reading and our writing. These are “high frequency” words after all! They arrive naturally and unbidden: from their writing; from their independent reading; from their guided reading with me; and from the shared reading we do as a whole class. Of course, I often guide us toward discussion of words that will be the most widely useful, or concepts that will be the most relevant and generative at any given time. But the children really do take the lead, and certainly bring questions, observations and discoveries that I had not considered before. Secondly, it allows the introduction of these words to become platforms for introducing generative concepts, rather than simply about memorizing single isolated spellings. Many of the words on those lists are function words that don’t carry a great deal of meaning, but they can be used as examples of important orthographic principles in the areas of morphology (meaning), etymology (history and relationships) and phonology (sound representation). I always tell the story of my first Grade One class who all knew how to spell <the> because they had learned a little jingly song about it, but very few knew there was a digraph, none knew the term digraph, and none knew what phoneme the digraph represented in <the> (though they had no trouble observing it was different than <with>. By analyzing the word, we are able to introduce several fundamental concepts that were then reinforced over and over–and helped us make sense of other words. Sometimes these discussions lead to further, longer investigations; sometimes the word just goes on the Word Wall because we agree it will be useful to have it in our collection (because we will “frequently” need to use it in our writing, for instance). One of the other features of the word wall is that we begin to sort the words into sub-categories, according to what grapheme represents each vowel phoneme. I colour-code these with other stickies (yes, I use a lot of stickies). Like the words, I choose to add the graphemes as we go. This becomes another source of discovery for the children. To hear children exclaim, “We found a new letter team!” (or, as my own practice has evolved, “a new digraph!”–they are totally comfortable with these terms) is not at all uncommon. Again, the children are driving the learning, and teaching their peers. See in the picture below where the word <saw> led us to discover the grapheme <aw> for the short <o> phoneme. Note that this helps to normalize the reality that this phoneme can be represented by <a> or <o>. This also helps to establish that though there is complexity, there is also order: yes, there are a lot of graphemes for long <e>, but there are not an infinite number, and we can learn patterns that help us to understand that this is not random. (To see this in action, check out the last couple of minutes of this film that Pete Bowers made in my class a few years ago). Eventually, we find words that don’t fit easily under the headings we’ve got, and have to create more! These include the dipthongs, and so on. I have begun to experiment with using the IPA symbols for these, and so far it has been fine. Finally, not every word gets a big treatment: many times we simply say “Should this word go on our Word Wall? Where should it go?” Having students place it reinforces for everyone the structure of the word, and reinforces the structure of our shared resource. The Word Wall becomes a collection of data that we can analyze, helping to reinforce and establish patterns and conventions. For instance, certain patterns arise in the long <a> phoneme. The children independently began to notice that <ay> always appears in the final position in the base elements we gathered. Similarly, <ai> never appears there. This helped to deepen our understanding of the shared roles of <i> and <y>. In our reading, the word wall becomes a regular resource. As children work to decode an unfamiliar word–<draw> for instance–they are now able to scan the graphemes on our wall for <aw>, link this to the phoneme above and have an enhanced shot at pronunciation. In our writing, the word wall grows as a resource for spelling these high frequency words. Having included the children in its creation helps them to know where the words are and why. But it also becomes a tool for figuring out other words. I can prompt a child to look for graphemes that fit the phonemes they identify orally. My aim is to have them make reasonable spellings, on the way to accurate spellings. (Thus, in Grade One, I am delighted to see someone write <rayn>, and hope that further learning will lead to an understanding of why <rain> is the correct spelling). This all takes practice, of course! The first form of practice is regular use. But we had a number of games and activities that involved the word wall. (The Internet is probably filled with these for more conventional word walls–I expect many would apply to my version). If you are still here reading, below is a video of my class playing “I Spy”. Note that some children really do need the practice, and how the whole class gets to practice various concepts as we go. (Note also how I have trouble filming and teaching at the same time). Hope this is helpful! Please let me know if you have any success with this system, and especially if you modify, expand or improve it.